Harriet Manners knows a lot of facts. Being a Geek + Model = a whole new set of graffiti on your belongings. But clearly she knows nothing about boys. And on a whirlwind modelling trip to Tokyo, Harriet would trade in everything she's ever learnt for just the faintest idea of what she's supposed to do next. When this came through my letterbox, I was so excited to start reading. As I turned the first few pages, I soon remembered why I loved the first book so much. 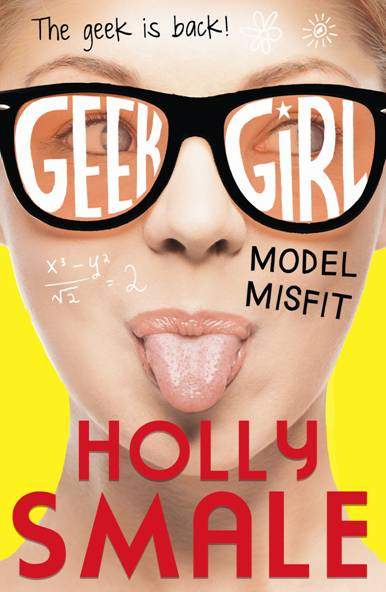 Filled with witty-humour, personality and a whole host of characters to love, Model Misfit is a fun-filled continuation of the Geek Girl Series that became something I couldn't wait to pick after a long day! At the beginning of this book, Harriet Manners is taking another step towards her own metamorphosis: she is spreading her wings. A new baby is on the way, her model boyfriend Nick has dumped her and she feels thrown to the side now her best friend Nat is going to France for the school holidays. The only thing she has to look forward to is spending the days with her delighted stalked Toby. Now approaching her sixteenth birthday, Harriet is growing up. Since the final pages of Geek Girl, she has gained more confidence yet she is still the fact-filled, dinosaur-obsessed, geek with the graffiti-covered bag we all love. This time, she's not afraid to stand-up to Alexa by pointing out a grammar mistake - readers will be willing her on at this point! I really enjoyed this novel - and wanted more as soon as it came to an end. Smale's writing is one of my favourite aspects of this novel. She has an ability to thrown in humour completely naturally and have you laughing-out-loud in every-chapter. Her writing completely reflects Harriet's personality yet, is so simplistic you can just enjoy this book and be happy to. You feel like you have a relationship with these characters, and realise that you're completely connected to their lives. I went through moments where I would be angry at a character, next I would be sitting jaw-dropped(you'll realise why at the end) and then willing another on. I couldn't help but share the facts I was reading with anyone I could find - and looked forward to what I would find out next. The plot in this novel had constant twists and turns, and definitely kept you guessing! On the other side of the world, Harriet continues to struggle with modelling. Although, it comes together at the end and you instantly realise how smart Smale was when it came to planning this novel. Everything tied-up at the end like a boxed-gift covered in dinosaur wrapping paper - and it shows it had brilliant plotting! The way it all worked, the little hints but never too much, made an even better ending. The only reason I haven't given this book five stars, is not for my lack of enjoyment. I did feel like things were over-done at times. Wilbur's 'quirks' were over-used and I liked them in the first book for how they were an added-extra. I found when they were repeated constantly on a page, they lost that naturalness! Also, I would have loved to have seen Harriet looking around Tokyo more, as it's such an interesting city! 4 Stars - A must read for fans of the first novel, and anyone who is looking for a light-hearted and fun read! I had this in the post a while back and am SO looking forward to reading it - but I need to find book no. 1 first! Can't wait to get round to them, and thanks for the review! I've had this for a couple of months now, I think, but haven't had a chance to read it yet :( REALLY LOOKING FORWARD TO IT THOUGH *happy dance* So glad you enjoyed it!